Canadian marijuana is mostly grown indoors, sending massive amounts of energy up in smoke. Step into the flowering room at any of Canada’s 130-plus legal cannabis producers, and you’ll be struck by the orange glow of high-pressure sodium lamps. Then you’ll hear the whir of air-circulating fans and HVAC systems. You probably won’t notice the finely tuned temperature and humidity levels those systems maintain. All these climate controls require energy — lots of it. A single joint’s worth of marijuana grown through conventional indoor cultivation techniques produces around 1.5 kilograms of carbon emissions, equivalent to powering a 100-Watt light bulb for 25 hours, or driving a hybrid car about 40 kilometres. Add up all the joints purchased at pot shops from “Vansterdam” to “Hashifax” since Canada legalized recreational marijuana in October, and that’s a massive amount of energy going up in smoke. A single joint grown indoors produces around 1.5 kilograms of carbon emissions, equivalent driving a hybrid car about 40 kilometres. Greenhouses in Canada are marginally more efficient than fully indoor grow sites. But in a country that’s cold and dark for much of the year, these high-tech facilities often still need artificial lighting to supplement the sun, and the energy bills for heating in winter and cooling in summer remain substantial. That’s why Ernest Small, a research scientist with Agriculture and Agri-Food Canada in Ottawa, wants to see cannabis grown the way nature intended: outdoors. “This indoor growth phenomenon has limited viability,” he says. The author of Cannabis: A Complete Guide, Small speaks with authority. He was in charge of Health Canada’s supply of research marijuana in the 1970s, and he helped retrofit the abandoned mine shaft in Flin Flon, Manitoba, where the government’s stash was grown in the 2000s. As Small points out, the only other agricultural crops grown commercially at scale in greenhouses are those like tomatoes that don’t keep long or transport well, and thus can’t be shipped in from afar in the off-season. Cannabis is not like a tomato. When stored properly, dried cannabis flower can retain its potency for years. And much of the market growth for legal cannabis is driven by specialty edibles, topicals, beverages, and tinctures, all of which rely on concentrated extracts with even longer shelf lives. As such, says Small, there’s really no reason to produce cannabis in power-hogging greenhouses or sunless indoor grow farms. The plant can be grown outdoors more cheaply, with reduced water requirements and a lower joint-to-pollution ratio during Canada’s long summer days — and then stored for later consumption when the snow begins to fly. Canada’s short growing season may only be amenable to one or two grow cycles per year, though. To maximize profit and produce enough inventory to keep up with soaring consumer demand, it might make more sense to cultivate cannabis year-round in an equatorial country where the climate and day length are ideally suited to the plant’s needs, and then ship the plant or its pharmaceutically active extracts back up north. That’s exactly what companies like PharmaCielo and Khiron Life Sciences are doing. 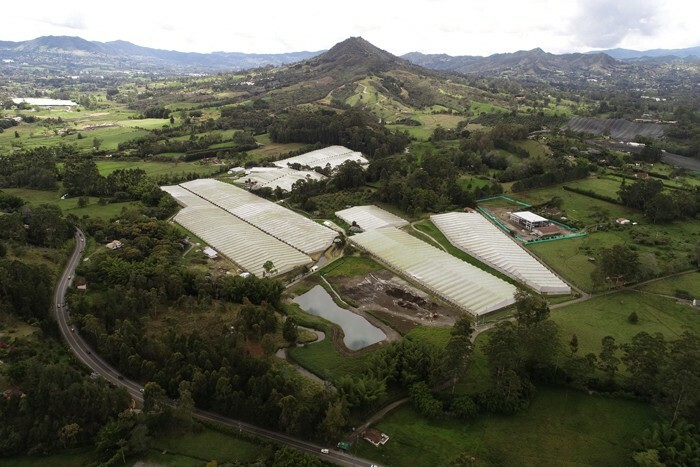 Although both are technically headquartered in Toronto — which gives them access to Canadian financial markets — all their cannabis cultivation takes place in the Colombian Andes. “Twelve months out of the year, we’re in blooming cycle,” says Marcelo de Siqueira, chief operating officer of PharmaCielo in Rionegro. The company maintains 12 hectares of open-air greenhouses near the Medellín international airport — no supplemental electricity needed. These lush outdoor grow centres without walls rely on Mother Nature for light and water, but use translucent tarpaulin roofs to diffuse the sun’s beams and protect the plants from heavy direct rainfall. Uruguay, as the only country before Canada to permit recreational cannabis use, may have been the first Latin American nation to embrace the global trend toward legalization. But Colombia has done much more to capture the economic opportunities of cannabis in the three years since the country started allowing medical marijuana production. In 2018 alone, the Colombian government authorized the harvest of more than 40 metric tonnes of cannabis for export — enough to fill close to half of all marijuana prescriptions around the world. Consequently, investment money has come rushing in from abroad, with many of the world’s larger cannabis players establishing subsidiaries there. Offshore production in countries like Colombia is really going to dominate the world market. Under Colombian law, exporting unprocessed cannabis flower is not permitted. And Canadian regulations ban all imports for the recreational side of the market. But for medical use among patients who want cannabis extracts, “offshore production in countries like Colombia is really going to dominate the world market,” de Siqueira says — and that should help reduce the environmental footprint of Canada’s burgeoning cannabis industry. Last year, PharmaCielo commissioned the Global Footprint Network, a sustainability think tank, to compare the ecological impact of producing cannabis under different industrial-scale cannabis cultivation setups. 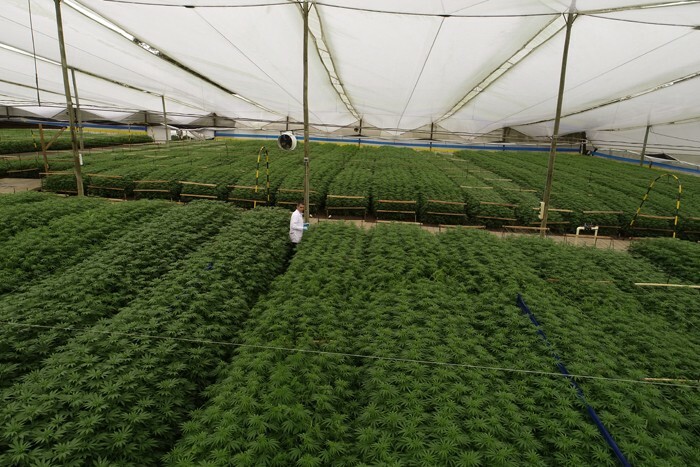 In their report, the study authors concluded that cultivation in an open Colombian greenhouse was about 370-times more energy-efficient than growing the same pot in a closed, artificially lit warehouse in Colorado. Although shipping weed or bottles of cannabis extracts around the world would add slightly to their carbon footprint, it would still have a fraction of the environmental impact of marijuana grown indoors. Despite the environmental and financial costs, companies are still investing in warehouse-grown weed. About an hour’s drive east of Toronto, in Cobourg, Ontario, FSD Pharma is currently in the process of converting a former Kraft factory into a 20,000-square-metre hydroponic cannabis production and processing facility. Originally a vinegar factory, then a pectin plant (the largest in the British Empire), and later used to manufacture Kool-Aid, Tang, Post cereals, Cool Whip, Shake & Bake, Gaines dog food, and other products, this storied property will soon be home to the largest indoor cultivation centre in the world. 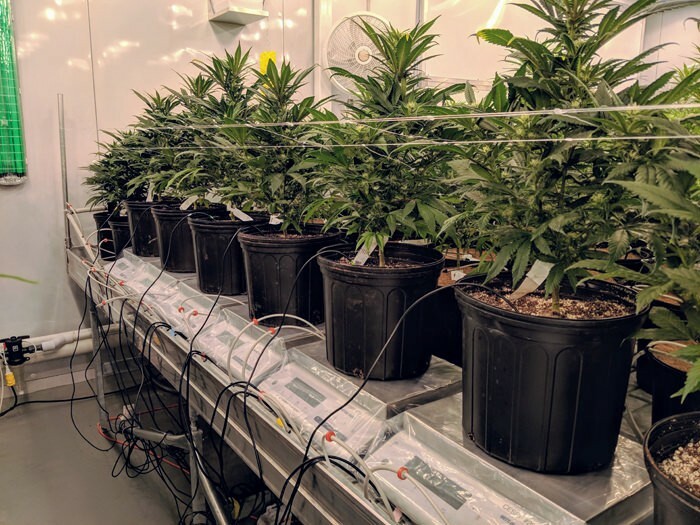 Meanwhile, another mammoth grow-op — the 75,000-square-metre Aurora Sky facility, the largest of its kind in Canada — will soon open next to the Edmonton International Airport. The C$150 million build-out includes rows upon rows of sophisticated greenhouses that capture some sunlight, but are full of sensors and environmental controls to augment what nature has to offer. And in a location where the sun is up for fewer than 7.5 hours in late December and outdoor temperatures plummet to -20°C and below, these greenhouses will undoubtedly require considerable heating and supplemental lighting in wintertime. Just think of the size of the Enmax bill! Field cultivation is not an environmental panacea. The limited body of scientific research on the subject comes from California, where regulations governing cannabis cultivation are less stringent than Canada’s, and the industry — owing to a legacy of prohibition — is dominated by semi-clandestine, small-scale outdoor operations. That research shows growing weed at scale can dramatically alter the landscape, leading to forest fragmentation, stream modification, and a host of other ecological problems. Potential windfall profits produce opportunistic land use, and have environmental degradation as a result. The widespread use of pesticides and rodenticides is also contributing to declining numbers of northern spotted owl, and the weasel-like Pacific fisher, among other threatened wildlife species. “Cannabis agriculture is disproportionately impactful to forests,” says Jake Brenner, an environmental scientist and geographer at Ithaca College in upstate New York. By God, you grow virtually every other food plant and medicinal plant outdoors. “By God, you grow virtually every other food plant and medicinal plant outdoors,” Small says. Why then, he asks, should cannabis be any different? Freelance science writer specializing in biomedical research and drug discovery.